With the amount of data we download and go through each day, it is no wonder that we run out of bytes faster than we get hungry. There is virtually a never ending list of torrents that we want on our hard drives along with song after song, that even a 320GB hard drive fills up pretty fast before we realize it. What is the home user to do other than purchase one portable hard drive after another while building up a collection of DVDs? 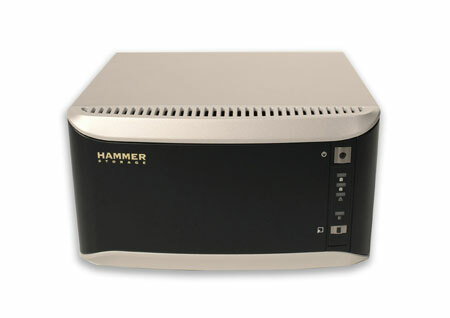 There is a solution from Hammer Storage that offers a brief moment of respite – the myshare external hard drive. This monster of a hard drive (capacity wise and not its size) is the perfect interim solution, featuring up to a whopping 2TB of space. Just in case your mental calculation prowess is less than stellar, that equals to approximately 2,000GB. Ladies and gentlemen, with that kind of space, you will be able to store your entire collection of music, photos, and videos with plenty of room to spare. Of course, the ability to hook it up over a network makes it even more versatile as you swap all sorts of multimedia files between computers in a secure manner regardless of whether they are PCs or Macs. The myshare external hard drive will be available in many configurations – 320GB which consists of a couple of 160GB hard drives (HN1200-320), 500 GB which consists of a couple of 250GB hard drives (HN1200-500), 640 GB which consists of a couple of 320GB hard drives (HN1200-640), 1TB (HN1200-1000), 1.5TB (HN1200-1500), and the big mother of all, the 2TB model (HN1200-2000). Dude! $1,300 for a 1TB MySpace drive is not cool! Wayyy too expensive; however, it hearkens back to the times back in 1991 when a CD Writer drive was listing at $1,000 bucks. I can see a time coming soon when this will be going for the same amount. Of course, we’ll be up to Windows 2012 EOT (End Of Times) edition by then, and that will probably require a 2TB drive, so it’s a moot point. I’ve invested in one of these http://www.infrant.com/products/products_details.php?name=ReadyNAS%20NVPlus – when I get a chance I’ll do a writeup! Yeah, I went to Amazon to check it out (ReadyNAS). I can get the Special Disk-“less” version with four “empty” trays for 800 bucks. Hmmm…now I only need those expensive hard drives to fill them in with. But I would be interested to see a write-up on it. Marc is right….having to take a hit on the failure would be a rotten, rotten thing. The cost, though, oh my!